However, in the past week, I’ve heard diverging narratives from people across the eastern USA about their experience. Some lament that this was horrible weather, the worst ever — how can climate change be real? Others lament that it used to get much colder — we have it easy today because of global warming. So what’s the truth? 1) Was Wooster’s cold spell out of the ordinary? 2) Is winter not as harsh as (or harsher than) it used to be? 3) Is climate change to blame? 1) Last week’s cold was not out of the ordinary. There’s two ways to think about how cold it was. One is that the daily high was only 9.6°F, which is frigid — it never topped 10°F. Another is that the daily low was -6.0°F, and that occurred while students would have been walking to classes in the morning. I can’t speak much to the wind chill because the OARDC station is too far from campus to give an accurate assessment. Wind varies a lot more temperature from place to place, so it’s hard to know exactly how bad the wind chill was for any random person walking with exposed skin outside. For temperature, though, the weather forecast was spot on. 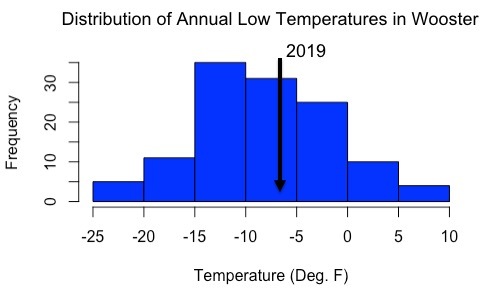 Figure 1: The distribution of the annual low temperature in Wooster (the lowest daily low) from 1900 to 2018, with 2019 marked. That temperature, however, was not exceptional. Funny enough, January 22, 2019 actually had a lower low of -7.2°F — it just wasn’t as windy. 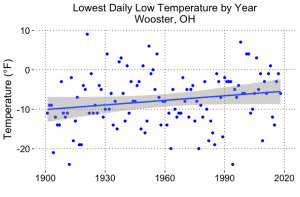 In Wooster, the average annual low temperature since 1900 is -7.6°F. The average lowest daily high is 11.0°F. Our 2019 is currently right in line with those numbers (although the winter is not yet over). 2) The coldest days might be getting less severe. This is actually a tricky one to answer. If you look at the coldest temperature recorded each year at the OARDC, nearly every year before 1930 had at least one day in which the temperature fell below 0°F — but not so from 1930 to 1960. The coldest cold was above 0°F about in about 25% of the years in that second period. From 1960 to 1990, the reliable sub-zero temperatures returned. Since 1990, the annual coldest day has been less severe again on average. In other words, if you only look back to 1960, yes, the worst days have been getting less severe. But if you look back to 1900, the last 120 years suggest that Wooster still gets plenty of cold. So if you were born in the 1950s, no, the new generation doesn’t have it easier, but they may be more sensible about preventing frostbite. 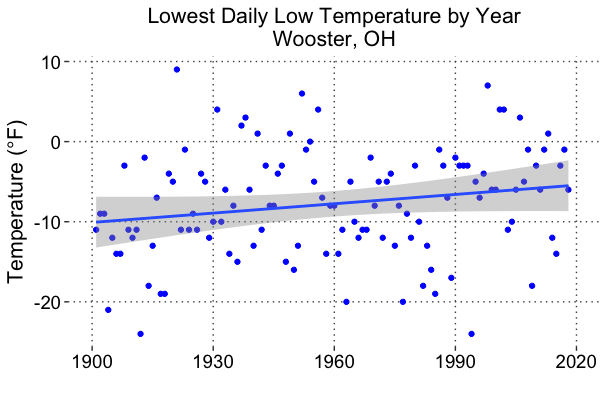 Figure 2: Time series of the the lowest daily low temperature (the coldest temperature each year) in Wooster from 1900 to 2019 (so far). Edit: With 99% confidence interval on the trend line. 3) There’s not a clear climate change signal here. The problem with evoking climate change is that weather extremes are by definition rare, so it’s hard to pinpoint the immediate cause of local-scale weather extremes to long-term, global-scale warming. There is some evidence out there that the polar jet stream (a.k.a. the “polar vortex”) is becoming more erratic as the world warms, leading to more days like January 30 when the Arctic Ocean is warmer than Minnesota, but that is not settled science. Plus, there’s no clear trend with this particular measure. In other words, it’s premature to blame climate change for every weather event you don’t like. Well done, Alex. I learn a lot from these clear, well-written posts about weather and climate. Spot on, Dr. Wilson. Are geologist the only people capable to putting some sense in global warning. I am appalled by the hype and hysteria about climate. And the bogus reporting of “wind chill.” Why don’t TV weather reporters report “wind chill” in the summer time. Earth has adjusted to change for much longer that humans have been around and our sojourn here is just as subject to vagaries of the universe as the dinosaurs. Not that we shouldn’t take care of our environment but we need to take the long view and not let the money grubbers form our opinions and actions. Alex, have we had this conversation before? People’s memories are incredibly/disturbingly short (clearly, mine included…). Just a few years ago, here in north-central Ohio, we had consecutive winters with low temps in the sub -20F range (actual temps, not wind chill), which was unheard of in the mid-century. People have been hyper-sensitized to weather changes, thinking that, because of the news surrounding climate change, those weather-related variances are directly representative of climate change. And, while we have occasional statistical outliers (like those -20+F days), most of the data fall nicely within a (rather large) standard deviation. Yet again, a case of poor education on our part. As I’ve mentioned before, the main reason I dislike using temperature data, over the long term, in education about climate change is the horrible standard deviation (as in your time/low T plot, above). Most people simply don’t understand that the shotgun-spray-pattern of weather data must be averaged into a rather poor-looking “best fit” approximation of climate, over decades and centuries, one which encompasses a large amount of natural (and, perhaps, some unnatural, as if humans aren’t natural) variability. Again, as I’ve said before, it’s so much easier to look at glacial retreat, permafrost loss, sea level rise, animal migration patterns, and the slow marches of the boreal forest, as touchstones that more viscerally reflect climate change, than our yearly fight with weather and the variable temperatures (and rainfall, etc.) it induces. On your next time/temp-plot, put in lines showing the standard deviation, so that we can all see the likely range of “normal” highs and lows that are the natural results of weather. And, thank you for the time it took to put together the post! Nice job Dr. Crawford – good to see the Wooster data shown like this, thanks.